QUEENS, NY (CelebrityAccess MediaWire) — A once well-known sports and entertainment facility, the Forest Hills Tennis Stadium, may be revived to again serve as a major concert venue. Representatives from the West Side Tennis Club, located adjacent to the stadium, signed an agreement with promoter S2BN to stage 19 concerts at the 15,000-capacity venue over the next three years, starting with a performance by Mumford & Sons. 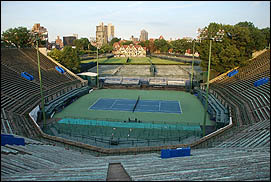 The stadium used to serve as host to the U.S. Open Tennis Championships from 1915 to 1977, when the event was moved to a larger capacity venue. Concerts staged at the stadium include The Stones, Jimmi Hendrix, The Who and The Beatles. Bob Ingersole, the tennis director and facilities manager at the West Side Tennis Club told the Forum Newsgroup that the stadium was being renovating the stadium ahead of the first concert on Aug. 28.